For the Nintendo DS game, see Call of Duty 4: Modern Warfare (Nintendo DS). 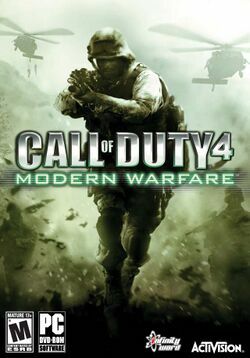 Call of Duty 4: Modern Warfare, known as Call of Duty: Modern Warfare: Reflex on the Wii, is a first-person shooter video game, developed by Infinity Ward and published by Activision for the Microsoft Windows and Mac OS X personal computers and the Xbox 360, PlayStation 3 and Wii video game consoles. The game was released in North America, Australia, and Europe in November 2007 for video game consoles and Windows, was released for the Mac in September 2008, and was be released for the Wii in November, 2009. It is the fourth installment in the Call of Duty video game series, excluding expansion packs, and is followed by a direct sequel, Call of Duty: Modern Warfare 2. The game breaks away from the World War II setting of previous games in the series and is instead set in modern times. Call of Duty 4 was in development for two years, and it uses a proprietary game engine. During the single-player campaign, the player controls six different characters from a first-person perspective. The player assumes the role of a young SAS member named "Soap" MacTavish for most of the game, starting with his enrollment in 22nd SAS. Sergeant Paul Jackson is part of USMC 1st Force Recon deployed to the Middle East, and the player controls Jackson's character during five levels of Act 1. Captain/Lieutenant Price is an officer of 22 SAS who is playable in a flashback. Price is voiced by actor Billy Murray, most famous for playing Don Beech on the television series The Bill. Yasir Al-Fulani is the president of the unnamed Middle Eastern country mentioned in the game, and is playable only in the game's opening credit sequence before he is executed. The player assumes the role of an American thermal-imaging TV operator aboard an AC-130 gunship during one level, and a British SAS counter-terrorist operative infiltrating a hijacked airliner to save a VIP in the epilogue level. This page has been accessed 77,786 times.